In his social philosophy Sri Aurobindo emphasizes the need to examine the profound psychological factors behind the economic motives and causes of social and historical development. As per his framework, both an individual as well as a society progress through distinct psychological stages – symbolic, typal, conventional, individualistic/rational, and subjective. He also explains the inner meaning of these successive phases, the necessity of their succession and their purpose. This paper is an attempt to apply this psychological-sociological framework to understand the evolutionary process of an organization. The analysis presented here is introductory and opens up a new approach to understand the cyclical processes through which organizations may go through in their growth journeys. Relevant examples have been used from a case study of one particular business organization[i], Aravind Eye Hospital, and in a few instances, personal work experiences of the first author are also included to illustrate the point. 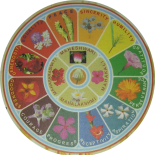 A close reading of Sri Aurobindo’s social thought suggests a strong parallel or similarity between the individual and the collective. An organisation or corporation is a collective, which like the individual has a body (outer appearance), an organic life, a moral and aesthetic temperament, a developing mind, and an invisible inner core or being, soul. The difference is that a collective or an organisation is much more complex because it has a greater number of individuals – each with their own physical, emotional and mental parts and their respective development, each pushing and pulling the group in different directions, resulting in the group soul taking a very crude outer form. It is only through an evolutionary process that the organisation, like the individual, becomes more self-conscious of its various parts and their interconnection and role in expressing its deeper purpose, its deeper spirit. The parallel between the individual and the collective organisation does not end here. It extends further to the purpose of their existence. The primal law and purpose of individual life is “to seek its own self-development. Consciously or half-consciously or with an obscure unconscious groping it strives always and rightly strives at self-formulation, — to find itself, to discover within itself the law and power of its own being and to fulfill it.” (Sri Aurobindo, CWSA, Volume 25, p. 37). The reason for this ongoing quest of self-discovery and self-formulation is because an individual is not merely an ephemeral physical creature with growing mind and body that eventually dissolve, but is an ever-evolving spirit with a living eternal truth manifesting itself through the outer form of mind and body and their development. An organisation, like the individual, has the same purpose of existence, namely, its constant self-formulation through its self-discovery and self-development. In practical terms this implies that as individuals we keep on re-figuring and redefining not only our self-fulfilment objectives but also our actions to fulfil them. This continual, evolving and iterative process of introspection and the resulting redefinition of self-discovery and self-formulation is similar both for an individual and an organisation. We often observe that an organisation, either by the pressures or dictates of external factors (market changes) or through an internal process of re-evaluation (core beliefs), strives to become more aware of the reason for its existence and the greater purpose it must serve. It may accomplish this through brainstorming sessions, introspection, and discussions. As with the individual, for an organisation also the process of self-understanding remains primarily at the mental level, and therefore, subject to many unknowns and mistakes. Hence, the need for an ongoing and hopefully an evolving process incorporating further introspection followed by action plan and implementation. To download full essay,….click HERE. This entry was posted on April 8, 2015 by Suhas Mehra in Management and tagged Business Studies, Organisational Studies, Spirituality in Life.